Jon Bon Jovi and Polo Ralph Lauren want to make volunteerism "hip". New Operating System Needed. From August 3-6 I attended the National Conference on Volunteerism and Service, held in Washington, DC. I attended wearing my hat of Commissioner for the Illinois Commission on Volunteerism and Community Service. In that role, I focus on building volunteer recruitment and support strategies that help solve problems in all parts of Illinois. However, I draw from my 30 years of leading a volunteer-based tutor/mentor program when I advocate for a new operating system to support volunteer-based charities. A new operating system focuses on the infrastructure needed for successful charities. It spreads the responsibility for the success of the non profit organization to all people who benefit. In the current structure the burden for keeping a charity afloat is generally limited to the efforts of the charity and its board of directors. While this works for some programs, it is a poor system to assure an even distribution of critically needed services in all places where they are needed. 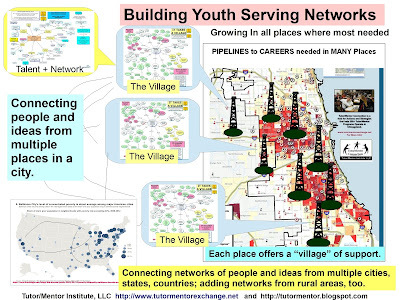 Through the Tutor/Mentor Connection (T/MC), I'm trying to create this new operating system, drawing from the help of volunteers of Cabrini Connections, and a network of other program leaders and stakeholders from throughout Chicago and the rest of the world. I'm trying to create a visual blueprint that identifies all of the things a tutor/mentor program needs to be successful. Since our goal is that our teens are starting jobs/careers by age 25, this infrastructure needs to enable us to provide continuous support to some youth for 10-15 years! b) more consistent public awareness (advertising) - When I was an advertising manager at Montgomery Ward (between 1973 and 1990) I was responsible for drafting an annual ad schedule that provided 3 waves of ads going out each week to nearly 20 million people in 40 states where Montgomery Ward had stores. Each ad had the same goal of drawing customers to stores near them. Wards spent more than $200 million each year on its national advertising during the 1980s. Charities don't have these type of ad dollars and never will. Thus we need strategies in business, churches, colleges and professional groups, and among media and celebrities, that use their resources to build on-going visibility for volunteer-based charities. Jon Bon Jovi was a speaker at last week's conference on volunteerism. Just recently he helped organize the Live8 Concert. We need more people to do what he's doing. Someone needs to be doing a Live8 type event every day! However, we also need to teach leaders and celebrities to put links on their web sites that point potential volunteers and donors to volunteer centers so that they can find the programs that are looking for help. c) flexible funding - if we cannot find the funds to create decent working conditions and to recruit and retain highly motivate and skilled people, we'll end with high turn over, which works against the first objective of retaining key staff. Instead of every tutor/mentor program in the city constantly searching for funds, we need to develop business type advertising strategies that motivate donors to seek out programs on a more consistent basis. One strategy is to find a way to put tutor/mentor programs in workplace fund raising campaigns. Another is find ways to increase planned giving bequests to tutor/mentor programs, or to organizations like the Chicago Bar Association's Lend A Hand Program, which distributes grants to tutor/mentor programs. d) talent volunteers - one of the workshops at the National Conference focused on the concept of Talent Volunteers. The presenters showed how most volunteer recruitment advertising focuses on the soft side of volunteerism. This conveys a message that you either become a tutor/mentor or do some other form of hands-on project, or you don't volunteer. While we need dedicated people to volunteer time as tutors/mentors, we also need people to volunteer time as accountants, planners, communicators, tech support, fund raisers, etc. If we can recruit more people to help build the infrastructure of tutor/mentor programs we can expand the support for staff, students and volunteers and come closer to achieving our goals. Imagine the National Mentoring Month campaign being "Who built your web site? instead of "Who mentored you?" e) elearning/collaboration mentality - there is so little time to network and learn from others, yet is it this process of constantly learning from others that leads to on-going quality improvement. Very few organizations are building this into their strategy. While there were over 2,000 people in Washington last week, most of us only met a few of these people, or attended a few of the workshops being offered. I was in a forum hosted by David Eisner, President of the Corporation for National Service, and Bob Goodwin, President of the Points of Light Foundation. While a few people got to ask questions, most did not. If the discussion had also had an internet component, such as at http://www.techsoup.org or http://www.digitaldivide.net, many of us could have continued to ask questions and network with each other in the weeks and months after the conference. Until we learn to link the Internet with our face-to-face strategies, we will not maximize the potential we have to mobilize the army of volunteers, and donors, who are needed to solve problems and strengthen America. f) spatial thinking - we need to teach people to use maps to show all of the places in big cities like Chicago where tutor/mentor programs are needed, and where existing programs are located. Without the map most cities focus on just a few programs, or a few neighborhoods. This means most kids do not have access to services and most programs are constantly struggling to stay in business. We also need charts and blueprints that show all of the different ways volunteers can be involved in a charity, and the continuous support kids need, from many people, to be starting jobs and careers by age 25. While I share this information with tutor/mentor leaders around the country, I also share it with the volunteers in the tutor/mentor program I lead in Chicago (http://www.cabriniconnections.net). Many of the volunteers we recruited for Cabrini Connections between 1993 and today have offered time and talent and treasure to help us build the services we offer through the Tutor/Mentor Connection. If volunteers from one small program can have this much of an impact, my belief is that hundreds of volunteers from dozens of connected programs can have an even greater impact. My goal is that other volunteer-based organizations adopt this "we" instead of me strategy. It's the only way we will ever get enough people together to build the better operating system that I dream of. While one of the featured speakers at the National Conference was Jon Bon Jovi, another was David Lauren of http://www.polojeans.com. Both men talked about making volunteerism "hip". Bon Jovi said it was his goal to make volunteerism "the new Black". Polo Jeans has launched a product and ad campaign that converts this vision to action. I went back to Chicago and told my daughter that she could buy her Back to School Jeans at Polo, even though they might cost more, because I want to support this campaign. That's the only way we can motivate hundreds of other companies to duplicate the thinking behind this campaign. These are all just my opinions. We're trying to make this vision a reality through the work we do in the Tutor/Mentor Connection and at Cabrini Connections. If you agree with these opinions, join us. If you disagree, post your ideas on a web site and let us take a look at your strategy. We can improve what we do if we can learn from you. You can improve what you do if you can learn from us and from other organizations that operate the same way. 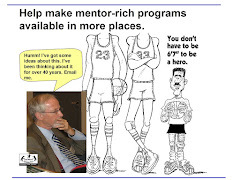 If you know of other companies who are even more effective than Polo Jeans in making volunteerism "hip" and in drawing attention to volunteer-based organizations, please add the web site link to the new Tutor/Mentor Connection portal. Serve Communities. Solve Problems. Strengthen America. This has been the goal of the National Conference on Volunteerism and Service which I'm attending in Washington, DC. Today was the second full day. My first session was a briefing on goals by David Eisner, CEO for the Corporation for National Service (CNS) and Bob Goodwin, CEO and President, Points of Light Foundation. Eisner talked about a new 5 year strategic plan for CNS and Goodwin outlined the key focus areas of Points of Light. These were a) build public awareness of the benefits of service; b) help build infrastructure through which service is delivered; c) collect and share knowledge about what works. These points resonated with me. Maybe its because they are the same goals we have for strengthening volunteer-based tutor/mentor programs. This was a pretty open session and many participants were able to make comments or ask questions. When it came my turn, I asked when they would host versions of this type of CEO interaction on the Internet where more people could ask questions and interaction one on one with the leader of the organization, or with each other. It's not in the pipeline yet, but my question prompted one of the other participants to say "lets talk". This turned out to be Billy Bicket from www.techsoup.org. We spent more than an hour exchanging ideas, with lots of scribbled designs on paper and a commitment to look for ways where our organizations might collaborate. That was my goal in coming to DC in the first place. Meet people, get good ideas, build collaboration. Today's lunch was a general session dedicated to recognizing corporations for the good work they do to support volunteerism and service. The featured speaker was David Lauren, Sr. Vice President of Advertising, Marketing and Corporate Communications for Polo Ralph Lauren. While we expected another corporate self promotion, this was the real deal. I urge you all to visit www.polojeans.com and learn about The G.I.V.E. Jean. Yesterday Jon Bon Jovi said he wanted to make volunteerism hip. Polo Ralph Lauren is putting this vision into action. I networked with a variety of other corporate and volunteerism leaders this afternoon, but the focus of all of my efforts were to show people how they could use the good ideas they learned from the companies like Polo Ralph Lauren, to motivate businesses in their own communities to duplicate these ideas in support of local charities. Buy G.I.V.E Jeans this fall and you'll send a convincing message to other companies that marketing volunteerism is good for the community, and good for the company. In a few days I'll add links at www.tutormentorexchange.net to the various companies who received awards this week so that these can be used as models in local corporate involvement campaigns. If you know of other companies that are as innovative as Polo, send details and a web site to me or tell me by posting a comment on this blog. I'll be back in Chicago late tomorrow where I'll also be trying to use these good ideas to create greater support for tutor/mentor programs and other volunteer-based charities in Illinois. "If you keep doing what you do, you keep getting what you got." Robert Woodson, Sr.
Woodson's speech was introduced by a young man who had his life turn around thanks to Bob Woodson. The young man said "He was sent to me from Heaven. What I owe him is for me to stay on the straight and narrow path." Mr. Woodson's speech lived up to this introduction and if any reader ever gets a chance to hear him, take the opportunity. Woodson started off saying, "Those of us in the trenches fighting forces of evil have made a public commitment. We do not serve youth out of compassion, but of Godly obligation." That's a powerful statement. He went on to say "Give me strength to tell and pursue the truth, even when it is inconvenient to me." Then he said, "Self examination and self-criticism is the highest form of maturity." All of this was meant to challenge us to search our soul for why we do what we do, and to not be settled for the easy solution. I find that the biggest obstacle I face in approaching businesses, universities and foundations is that they are so invested in what they are already doing that they are not sitting back to see if that is enough, or if that is all they could be doing. Mr. Woodson's speech was preceded by comments by Anthony Williams, Mayor of Washington, DC, Marsha Bullard, CEO of USA Weekend Magazine and Cokie Roberts of ABC NEWS and NPR. Ms. Roberts said "business is making volunteerism a "core business function". While that may be true, I'm not sure if business is maximizing the impact of volunteers. One of the later workshops talked about "talent recruitment", which meant searching beyond one-on-one volunteers for talented people in a company who can perform many important roles in a volunteer organization. The final remarks were from Jon Bon Jovi, who seeks to "give back to people who have given so much to him". Bon Jovi wants to make volunteerism 'hip'. He said "I want volunteerism to be the new 'black'"
Later in the day I attended two workshops. One focused on recruiting volunteers for more roles than direct service with kids. This was a valuable workshop because it highlighted an important marketing issue. Most ad campaigns like national mentoring month, or the America's Promise campaigns focus on the act of mentoring a kid. I've felt for a long time that this gave the volunteer an 'all or nothing' proposition. For those who could not mentor, there were no other options. This workshop confirmed that and said that companies and non profits should target talented volunteers who can serve other roles. Imagine if in stead of "Who mentored You" the slogan for the 2006 National Mentoring Month Campaign was "who built your web site?" I ended the day by visiting the trade fair. I ran into four people who I'd gotten to know over the internet and met for the first time today. Two were with Business Strengthening America, one was Adam Aberman of www.icouldbe.org, and one was Kristi Zappie-Ferradino of the National Mentoring Partnership. It was electric when I introduced myself to each of these people and they recognized me as someone they had come to know via internet conversations. Hopefully some of the people I met will continue to connect with me and others in internet forums that bring us back together in the next few weeks and months. If that happens we'll be more likely to put the commitment of a Robert Woodson to work in more places. I'm posting this message from Washington, DC where the National Conference on Volunteerism and Community Service is being held. I'm a Commissioner for the Illinois Commission and was able to get a scholarship to attend. Tonight was a dinner sponsored by the America's Service Commissions. I sat at a table with representatives from Ford Motor Co., America's Promise, and leaders of the Ohio, Michigan and California Commissions. I think a leader from Campfire Girls and City Year was also at our table. David Eisner, CEO for Corporation for Volunteerism and Community Service, reads some quotes that originated with Senator Wofford. - What mattered most were his actions. The way he turned words into deeds." - We can solve our most serious problems by working together"
Rober Goodwin, CEO Points of Light said of Harris, "he's always drinking in knowledge and always sharing what he knows"
"this reminds me of the story about Mrs. Astor on the Titanic. Her last words as an iceberg crusher her cabin were, "I asked for ice water, but this is ridiculous." He finished with this thought: "When I wake up every morning I have to decide if this is a day I want to save the world, or a day I want to enjoy it." That's a good thought to go to bed on. Tomorrow will be a full day of networking with volunteers from throughout the country.